Situated oceanfront on Flamingos Beach, this AAA 4-Diamond beachfront resort offers excellent service and quality. 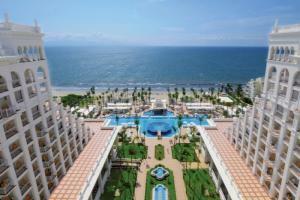 Its 445 guest rooms include junior suites equipped with hydro-massage bathtubs and some with a Jacuzzi® on the balcony. Conveniently located nine miles from downtown Puerto Vallarta, its magnificent architecture and elegant furnishings create a luxurious atmosphere and the ultimate distinction. Guests enjoy excellent beaches and water sports. The Riu Palace Pacifico is located on Flamingos Beach, only 2 minutes drive from Riu Vallarta and Riu Jalisco, just 9 miles away from downtown Puerto Vallarta. Horseback Riding, Adventure Tours, Whale Watching (between January and March), Deep Sea Fishing, Golfing, and Windsurfing.